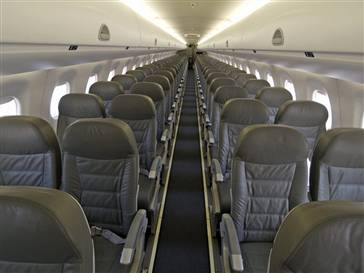 Just read on CNN [external link] that certain airlines are shrinking legroom in their coach seats. Being 6’3″ I have some experience with these small seats. “Not comfortable” doesn’t begin to cover it. In the article there are some stats of ‘seat pitch’ and other factors but a 3rd grader can tell you that given less space than needed isn’t smart. Eventually this constant and literal squeezing of the consumer will take it toll. You can only take bad service, and let’s be honest that’s what we are talking about, so long before you choose another option. It’s not just seat space either, every flight is oversold, leaving people who have paid for a ticket at the gate. This used to be a somewhat rare occurrence, not so anymore. At least the last 6 flights I have been on have been oversold. I think we should unite and show the airlines why we can’t be treated like this any longer. If every business travel changed one trip into an online meeting, would that get their attention? If we were all to take a month, say October, and not fly what do you think would happen to the airlines? Some people who must travel during that time (cross country funerals, conferences. etc.) would ensure the airlines had to fly those routes, but the planes would be more than half empty. The only thing that will make the airlines sit up and listen is to hit their bank accounts.